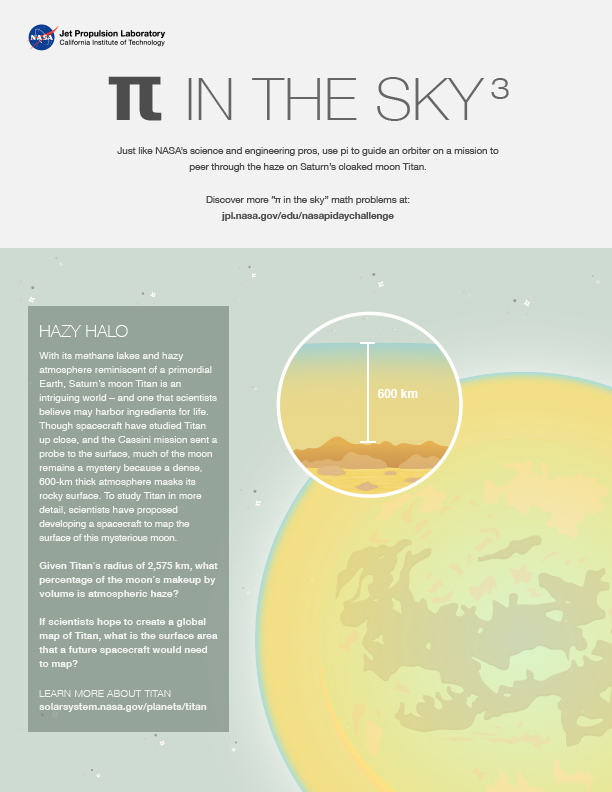 The "Pi in the Sky" math challenge gives students a chance to take part in recent discoveries and upcoming celestial events, all while using math and pi just like NASA scientists and engineers. In this problem from the set, students use the mathematical constant pi to find out just how much haze is on Saturn's moon Titan. Saturn's largest moon Titan is the second largest moon in our solar system, second only to Jupiter's Ganymede, which is only 2 percent larger. With a mean radius of 1,600 miles (2,575 km), Titan is bigger than Earth's moon, and even larger than the planet Mercury. Titan is the only moon in our solar system that has clouds and a dense atmosphere, mostly nitrogen and methane. It is also the only other place in the solar system known to have an earthlike cycle of liquids flowing across its surface. On Titan it is so cold (-290 degrees Fahrenheit or -179 degrees Celsius) that water plays the role of rock and lava, and flowing methane carves river channels and fills great lakes with liquid natural gas. Vast regions of tall dunes stretch across the landscape -- dunes whose "sand" is composed of dark hydrocarbon grains. The dunes are not unlike those seen in the desert of Namibia in Africa. Volcanism may occur as well, but with liquid water as the lava. Titan has few impact craters, meaning that its surface must be relatively young and some combination of processes erases evidence of impacts. This is the case for Earth as well; craters on our planet are eroded by the relentless forces of flowing liquid (water, in Earth's case) and wind. These forces are present on Titan as well. Tectonic forces -- the movement of the ground due to pressures from beneath -- also appear to be at work on Saturn's largest moon. Titan is the only moon in the solar system with a thick atmosphere. Titan's atmospheric pressure is about 60 percent greater than Earth's -- roughly the same pressure found at the bottom of a swimming pool. Because Titan is less massive than Earth, its gravity doesn't hold onto its gaseous envelope as tightly, so the atmosphere extends to an altitude 10 times higher than Earth's - nearly 370 miles (600 km) into space. Some of the compounds produced by the splitting and recycling of methane and nitrogen in the upper atmosphere create a kind of smog - a thick, orange-colored haze that obscures the moon's surface from view. And some of the heavy, carbon-rich compounds also fall to the surface. Some of these hydrocarbons go on to form grains that make up the "sand" of vast dune fields on Titan's surface. One of Titan's great mysteries is the source of its methane, which makes all of this complex chemistry possible. Since sunlight breaks down methane in the atmosphere, there must be a source that replenishes what is lost. Researchers suspect methane could be belched into Titan's atmosphere by cryovolcanism, or volcanoes with water as lava. With its methane lakes and hazy atmosphere reminiscent of a primordial Earth, Saturn’s moon Titan is an intriguing world – and one that scientists believe may harbor ingredients for life. Though spacecraft have studied Titan up close, and the Cassini mission sent a probe to the surface, much of the moon remains a mystery because a dense, 600-km thick atmosphere masks its rocky surface. To study Titan in more detail, scientists have proposed developing a spacecraft to map the surface of this mysterious moon. Given Titan’s radius of 2,575 km, what percentage of the moon’s makeup by volume is atmospheric haze? If scientists hope to create a global map of Titan, what is the surface area that a future spacecraft would need to map?